Tonight, the audience in Seattle got an enjoyable experience of having a few unique factors play into Frank Ocean’s performance at the Showbox Market. First off the news about Frank’s revealing his first love to be a male. Secondly, releasing his album a week early. When Frank Ocean first revealed his latest album Channel Orange to a close group of friends, family, and record company representatives, all electronic devices were not only turned off, but they were confisicated. Tonight I went in with the same approach. Tonight was not only about listening to the music, but taking in the experience of watching a man perform only after revealing some deeply personal things on his tumblr. In his music, Frank sings about the least controversial things, yet his personal life has generated the most publicity outside his companions Earl and Tyler. Of course it is important to stress that one should base the evaluation of the show mostly on the performance, but I cannot help but feel that this context further contributes to the discussion, especially later in this review. To say that there was an air of excitement in anticipation for the opening kickoff to Frank Ocean’s tour would be an understatement. I showed up thirty minutes before the doors opened at 8pm and the line had already stretched not only one, but two corners. The build up was further compounded by the fact that it took thirty minutes just to get in. The ticket scalpers were in full force, moving block around block, up and down the line, hawking their requests to for any spare tickets and eventually make a killing off of that. I saw a couple pay a hundred bucks each to get tickets for one reason only: Like all of us waiting in line, they couldn’t wait to see Frank Ocean. Here’s a general outline of the setlist for the night. I skipped over mentioning a few songs not to mention I probably messed up the order because I either don’t know some of the songs performed and I was too focused on enjoying the show. So let’s hit up the main observations from the show! There was no opener so as soon as the lights dimmed, everyone started screaming for Frank Ocean as he walked into a warm bask of adoration. The intensity of the crowd’s passion was so extreme that whatever song Frank Ocean was singing in the opening was drowned out by the cheers and screams. I think one element that cannot be understated is that Frank chose to showcase his well-known crooning with acoustic guitars backing him up. That’s a definite sign of his versatility, not to mention his eagerness to expand the musical boundaries of what R&B sound entails. Although I was most familiar with songs like “Thinking About You” and “Novacane”, I found myself enjoying more songs like “Forest Gump” and “Voodoo”, tracks that had either been released on Channel Orange or in between the mixtape and album. The biggest reason for this was because these tracks were so fresh or relatively unknown, only a few individuals sang along with Frank, allowing for more emphasis on the vocals . The show was thoroughly pleasing in terms of the high quality of it all. Frank has the coolness you would expect of a R&B singer, but the showmanship expected from any person associated with Odd Future (but a showmanship that is more dignified and cerebral).It’s signature Frank Ocean: the anxieties of un-reciprocated love, treated through the perspective of one who either received or inflicted it. However, Channel Orange takes it to a new direction in his music. His previous work nostalgia, ULTRA could sometimes come off as a little distant, but Frank Ocean’s latest changes that around. The diversity of the music foreshadowed at the beginning of the show was out in full force tonight. There was the dub step-inspired instrumentation in Frank’s lament about a stripper in “Pyramids”, the wonderful transition from the reverberating guitars of “Strawberry Swing” into the chorus of “Made It in America”. The show was exceptional in that it encompassed such a wide variety of genres alternative, R&B, soul, rock, and some real funky moments there. No matter what though, the crowd was enraptured, roaring with approval at the end of each song. As Frank left the stage, I took some time to scan around the room and I could not even see a single open space. From the bar section to the main floor, people were crammed together like sardines. Multiple slow claps (and in one instance slow stomp) were started to persuade the inevitable return of the night’s triumphant performer. However, the moment that really stood was the intimate end of the show, right after Frank took the stage one last time for his encore. 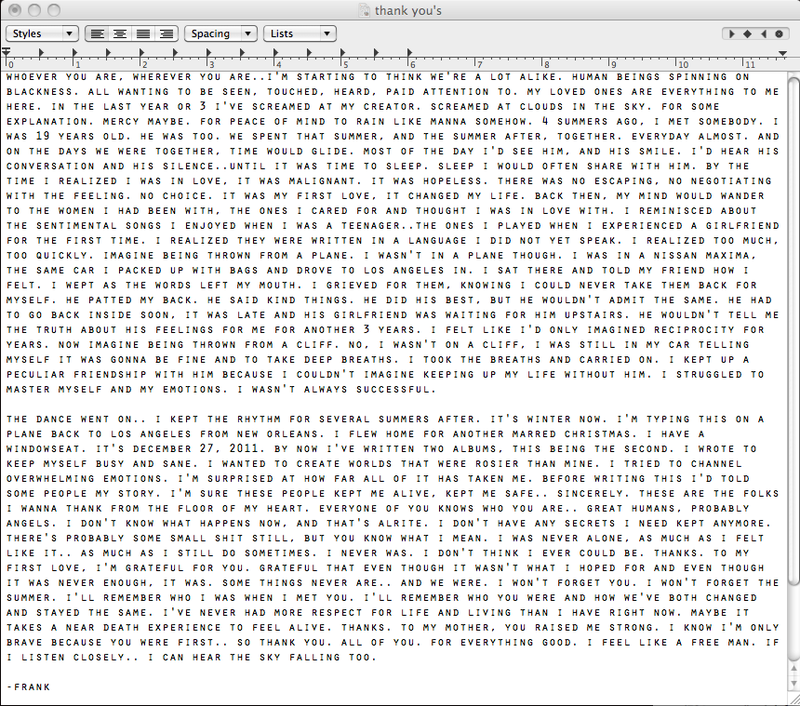 Before I delve into it, take a moment and check out the link to Frank Ocean’s tumblr. I highlighted some of the text that I want to discuss below. First we will all take note that although Frank wrote about his experience with a male, this episode does not singularly define him as that gay or bisexual singer from tumblr. Despite this key information, the narrative surrounding Frank Ocean will mostly be about that, for better or worse. The multi-dimensionality of Frank’s music stands in stark juxtaposition to the portrayal that people (including myself in certain aspects) have presented what had been some of Frank Ocean’s most private and personal thoughts. Despite our current insistence to heavily invest in the parts of Frank Ocean’s piece about loving another male, I would like to reference the final line in the passages shared from Frank’s post. He wrote “I feel like a free man”, and that post was his catharsis. Throughout the night, there Frank was, being affable and barely being able to keep a smile under wraps as he took in the cheers from the crowd. This was a man clearly at peace with his past, and hopeful for his future. I will now return back to my original point of discussion by recalling the image of Frank sitting there at the piano, all alone onstage with one spotlight shining down on him. For about a minute, he simply sat there and played, ignoring the pleas of a few young ladies for him to just sing. In many ways, I can’t help but feel that was symbolic of the recent events and attention in Frank’s life. No matter what he was doing, Frank’s actions were going to be placed under a microscope to be determined for further significance, or in the case of those demanding for him to sing, some would demand Frank to become an activist for the topic he chose to disclose earlier this month. In this final performance, Frank Ocean gently rebuffed all such attempts by continuing to play the piano before softly crooning about how he wished love between the two could just be simple. That line was repeated over and over again, with no information whether the recipient was a male or female. In that regard, it was an illuminating experience for me. Paradoxically, the casual matter in which Frank revealing his love experience is what makes it so noteworthy. It was done on his terms. The normalcy in which Frank presented this information paralleled those last minutes of his time in Seattle. The intimacy of that moment demonstrated how different and similar Frank Ocean is now. Even though that significant moment that Frank told his fan base has altered some of the soundbites in relation to his work, what doesn’t change is that Frank Ocean has the demeanor, the voice, and the production to be the biggest presence in the R&B scene. May this day be remembered not just for what he has accomplished but for what he has yet to finish. Thank God I was able to see it. Seth, my friend, you shouldn’t have sold that ticket to me because you missed out.